The European Tour 2018 season draws to a close this week at the season-ending DP World Tour Championship, where the leading 60 available players on the Race to Dubai (R2D) contest aim to climb as high in the rankings as possible to earn the bonus pool available for the top ten players, or be crowned champion golfer of the season. This year’s edition marks the 10th anniversary of the championship – an event that has provided the structure for the tour to maintain the appearances of the world’s best players and keep viewers entertained throughout the whole calendar year. A total of seven different players have won the season-ending championship from four different countries (England, Sweden, Northern Ireland and Spain). 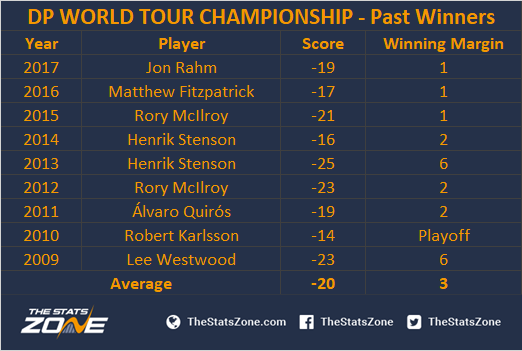 On average, the winning total has been -20, with -14 being the highest score in 2010 and -25 the lowest in 2013. 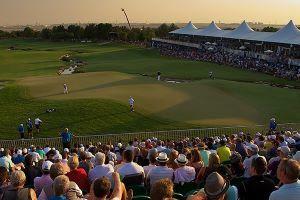 On four occasions, the winner of the DP World Tour Championship has succeeded in winning the Race to Dubai crown. Lee Westwood (2009), Rory McIlroy (2012, 2015) and Henrik Stenson (2013). Justin Rose has decided to sit out the season-ending championship even though he still has a mathematical chance of claiming the R2D. However, he would have needed victory this week and for Molinari to finish outside the top 40 in a 60 man field - a highly unlikely outcome. Paul Casey has also skipped this week whilst Julian Suri has withdrawn due to injury meaning Hideto Tanihara, Matthew Southgate and Robert Rock all get their chance to tee it up in Dubai and earn some end-of-season bonus euros. Consequently, only Ryder Cup heroes and best friends Tommy Fleetwood and Francesco Molinari can now claim the title. Molinari has been without doubt the standout European player of the season, having claimed the Open Championship at Carnoustie while taking down Tiger Woods in the process, as well as winning the European Tour’s flagship event - the BMW Championship at Wentworth. Furthermore, he has not finished outside the top 25 in any major and has produced solid performances in all the big money WGC’s. Fleetwood is bidding to become the first player since McIlroy in 2014 and 2015 to successfully defend the Race to Dubai. The Englishman’s season has been an example of consistency with just the one victory coming all the way back in January, but with just one missed cut and eight top 10s from 18 starts, including four from his last four, he will still be fancying his chances this week. Fleetwood essentially needs a victory and a very poor finish from the Italian to claim the R2D with over a million points currently separating them. Molinari has perhaps been struggling from fatigue in recent events, recording his worst two results of the season with a T56 and T43 respectively. A few weeks' rest should assure tiredness won’t be the case this week, making Fleetwood’s probability all the less likely. Lee Westwood claimed his first European Tour victory since 2014 at last week’s Nedbank Golf Challenge with a final round 64, moving up to 16th in the R2D. After getting himself in contention a few weeks ago at the Andalucia Valderrama Masters, it was perhaps no surprise to see him finally get over the line and claim his 24th tour victory. A win this week – around a course he dominated on in 2009 – would see him climb into the top ten in the rankings and send him into 2019 knowing he can return to somewhere near his best again and compete on the highest stage. To think how poor Rory McIlroy’s season has been by his standards, it is quite remarkable that he ranks sixth in the R2D from just 12 starts (none of those a victory). Furthermore, he is demonstrating no form heading to a venue that has produced some of his career best golf, which is exactly why he has to still be seen as a favourite this week. The Northern Irishman has won twice around here before and never finished lower than 11th, and from a total of 32 rounds, he has only once shot over par, resulting in a 68.2 stroke average. That is a hard record to dismiss! Masters champion Patrick Reed ranks fourth in the R2D from ten starts with five top 10s. A T7 in his last outing at the WGC HSBC Champions suggests his game is in good shape, while a T10 finish here last year shows he has the game for the Earth Course. A player for the big occasion, the American would love to put his name on one of Europe’s most illustrious trophies.